We did it, we survived it, we had a blast at it! A very big thank you to our families and all our guests for helping make it such a wonderful and memorable evening. I have bunches of photos, with more to come, and I'll be adding them in bits and pieces as life permits. Valerie's Adventure in Wedding Dress Restoration - Watch the bride play with 94-year-old silk. Costume Pictures - Our guests show off their "choose-your-own-period" finery. Costume Information Links - Having a historical costume wedding? A list of resources to get you and your guests started. 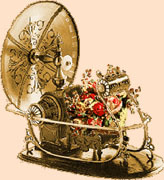 This Personal Wedding Pages site owned by Valerie Kessler. 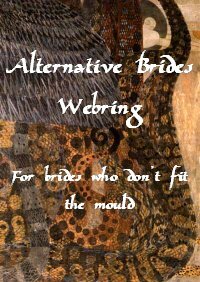 This Alternative Brides Webring Site is managed by Valerie Kessler.